Joint Admission Counselling Committee (JAC), Delhi announced the Upgraded List of Admitted candiates before Special Round on August 9th, 2018. Candidates check the Vacancies in the Special Round on 9th August in online from the official website @ jacdelhi.nic.in. The aspirants who want to appear for the JAC Special Round Counselling are able to register the names on August 10, 11, 12. candidates register you names to the nearest helpline centers. The JAC Delhi Admissions are based on JEE Main and All India Rank (AIR). The conducting authority declared type JAC Delhi Special Round Seat Allotment Lists in online mode. All the candidates who are seeking admissions in JAC Delhi are able to download the Special Seat Allotment Results. Through counselling the candidates can get admissions in various UG courses offered by the authority. 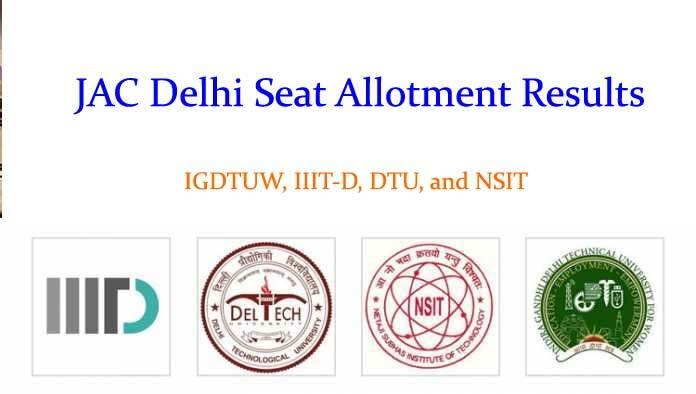 To get more information please stay on this web page, read the complete article we presented here the detailed information about JAC Delhi Special Round Seat Allotment results. JAC Delhi Special Seat Allotment Results are announced on August 13th, 2018. Candidates download the results from the link given below. JAC Delhi declared the Special Round seat Allotment Results for all the eligible candidates for the academic year 2018 -19. The candidates seeking admissions in UG courses and the participating institutes are IGDTUW, IIIT-D, DTU, NSIT. The aspirants who participated in this counselling must download the JAC Delhi Special Round Seat Allotment Results in online @ jacdelhi.nic.in. The admissions are based on JEE Main & AIR Ranks. Based on the rank the admissions will be granted to the candidates. After publishing the Special Seat Allotment Results the candidates take a printout for the future use. Already the JAC Delhi completed the Spot Round seat Allotment Results in online. Now it’s time to declare the JAC Delhi Special Round Seat Allotment Results. Applicants hurry up check and download the JAC Delhi Special Seat Allotment Results in online. The aspirants download the seat allotment results by entering all the details on to the official website. Enter your details like Roll number, Registration id, password, etc.